When identifying newly synthesized heterocyclic compounds by the 13C NMR, broadening and disappearance of signals of most quaternary and some tertiary carbons were observed in a number of spectra, which was attributed to prototropic tautomerism. The schemes of tautomeric transformations are proposed and justified. The structural features and other conditions necessary for the occurrence and observability of tautomerism are determined. It is shown that the more informative spectra can be obtained by an increase of the analysis temperature. Prototropic tautomerism is characteristic quality of some organic compounds to exist in the form of two or more structural modifications – tautomers which undergo mutual transformations as a result of proton transfer and redistribution of π-electrons . Keto-enol tautomerism and various types of prototropic tautomerism of heterocyclic nitrogen compounds are particularly well-known . The main method of tautomerism investigation is 1H, 13C, 15N NMR spectroscopy, even 17O, 31P NMR being used in some cases. So many articles devoted on identification of tautomers and the determination of the thermodynamic and kinetic parameters of the tautomeric reactions by NMR have been published, that, according to experts on the topic , the publication of one more paper on tautomerism should be justified either by the uniqueness of the systems involved or the method of their investigation. 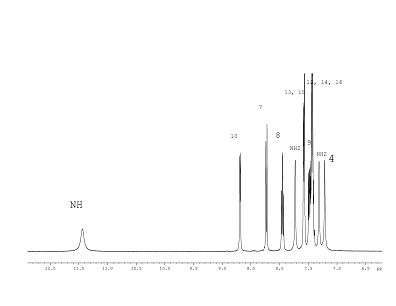 Nevertheless we believe to be encountered with the deserving to be issued special cases of tautomerism when analyzing the 13C NMR spectra of pyridine derivatives provided by the Omsk State University researchers . We have already observed the broadening and disappearance of signals in 13C NMR spectra due to chemical exchange induced by hindered rotation around urethane bond or hindered pyramidal inversion of nitrogen [4, 5] but in our practice the analogous well known phenomenon associated with tautomerism  has been observed for the first time. In the case of tautomerism, it is usually desirable to deal with fast or slow chemical exchange conditions when narrow (averaged or individual) NMR signals of the atoms of tautomers are observed. The intermediate exchange rate, when the lifetime of individual tautomers is comparable to the reciprocal of the difference in chemical shifts (expressed in Hz) of the corresponding atoms which belongs to different tautomers, leads to broadening and even complete disappearance in a case of 13C NMR of the signals [4, 5]. It was disappearance of some signals of 13C NMR spectra of DMSO-D6 solutions of 6-oxo-4-phenyl-1,6-dihydro-2,2'-bipyridine-5-carboxamide (1) and 6-oxo-4-phenyl-1,6-dihydro-2,2'-bipyridine-5-carbonitrile (2) (Scheme 1) that we encountered with. The shown random carbon numbering of pyridine derivatives is used in the article for signal assignment in NMR spectra. All the protons of compound (1) signals fully correspond to the proposed structural formula (Fig. 1). Initially, the signals of carbon 2 – 5 in the 13C NMR spectrum of compound (1) (Fig. 2) were not found. Only after a long (18 h) acquisition it was possible to detect the missing, strongly broadened signals of the carbons. We consider the signals of carbon 2 - 5 to be broadened as a result of the chemical exchange shown in scheme 1 on a base of the following facts. The phenomenon is not observed in a case of the large number of the similar hindered bulk pyridine derivatives available in the absence of NH protons in molecular structure. In the absence of the second pyridine cycle as the substitute and the second N-atom as a potential target of tautomeric proton transfer no broadening of the signals in the 13C NMR spectrum occurs. 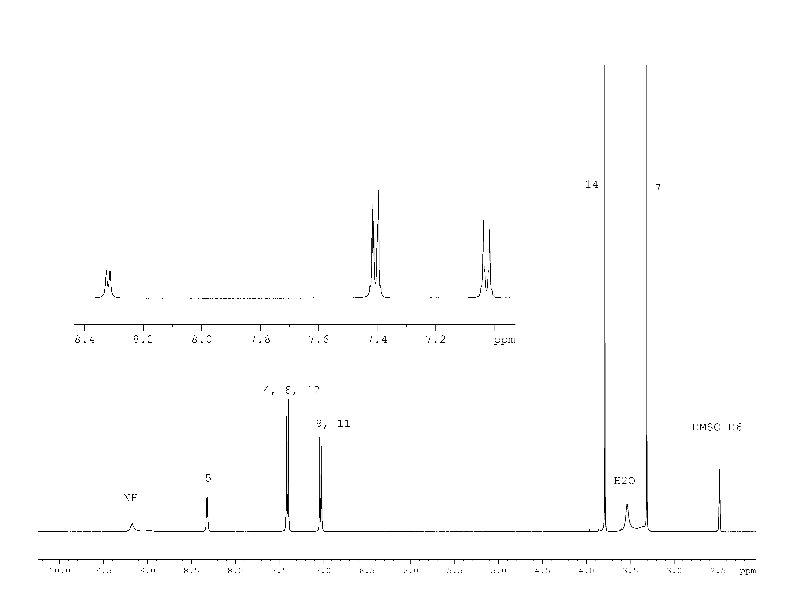 For example 13C NMR spectrum of 4-(4-methoxyphenyl)-2-oxo-1,2-dihydropyridine-3-carbonitrile (3) in DMSO-D6 (Fig. 7, suppl. materials) contains no broadened signals, though lactam-lactim tautomerism is well known . So it is the suggested tautomeric equilibrium (Scheme 1) that provides the conditions for the intermediate exchange rate and causes broadening of the carbons 2 -5 signals of compound (1). 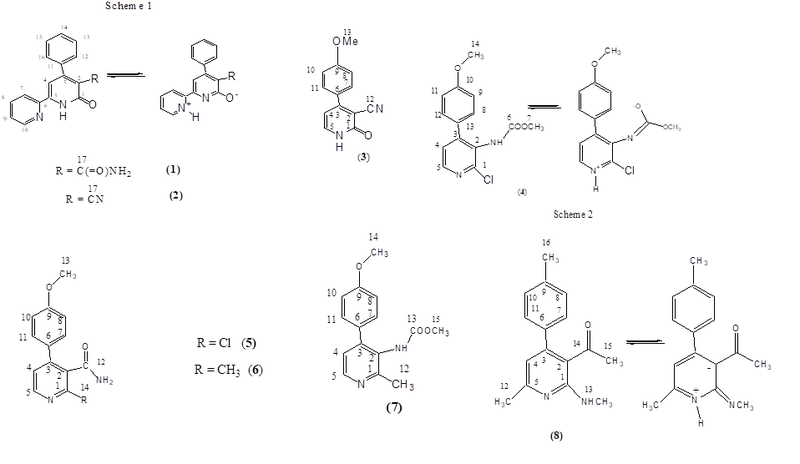 Though we have no arguments based on spectroscopy (NMR) or mathematic modeling in favor of pictured zwitter ionic structures (scheme 1) they seems to be reasonable. At least the analogues polar structures are included in the published tautomeric equilibrium schemes . 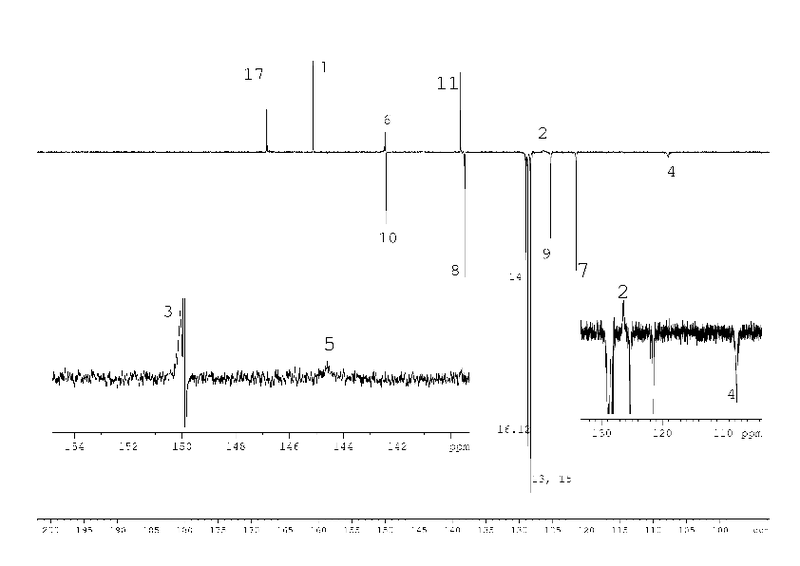 1H, 13C NMR spectra of compound (2) with the assignment of signals are shown on figures 3, 4. The simple and informative 1H NMR spectrum (Fig. 3) of the compound (2) fully corresponds to the proposed structure. 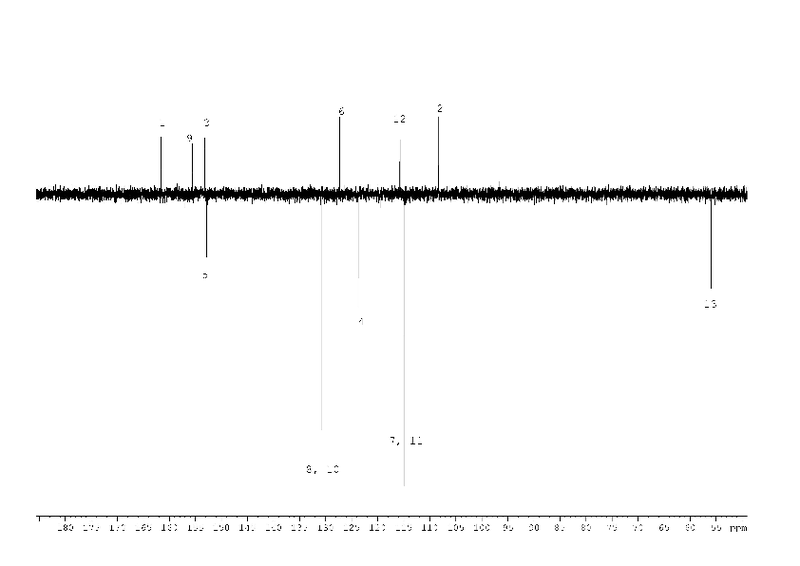 Alongside with that, in 13C NMR spectra of compound (2) the signal of carbons 1 - 6 were not observed at the temperature of 30 and 60 0C even after 30 hours of acquisition (Fig. 4). The spectra contain only two signals of the carbons 11, 17 of the compound (2). Consequently, the fast exchange (Scheme 1) conditions are realized only for these carbons due to the quite expected small chemical shifts difference in the tautomers. The temperature increase up to 90 °C made it possible to create conditions for rapid exchange for other carbons of the compound (2), except for carbons 2, 5. As a result, the signals of carbons 1, 3, 4, 6 broadened to a different degree in the spectrum become observed (Fig. 4). Chemical exchange similar to that depicted in Scheme 1 made it possible to explain the difficulties in obtaining of an adequate 13C NMR spectrum of methyl [2-chloro-4-(4-methoxyphenyl)pyridin-3-yl]carbamate (4) due to the broadening of several signals (see Scheme 2). The 1H NMR spectrum (Fig. 5) of the compound (4) corresponds to its structural formula. In accordance with the proposed scheme 2, the signals of carbons 1, 2, 3, 5, 6 of the compound (4) in Fig. 6 are several times wider than the signals of carbon 10, 13 of phenyl substitute hardly influenced by suggested tautomerism. It took 12 hours to obtain the spectrum shown in Fig. 6. At the same time, an hour was enough to record the full spectrum of 2-chloro-4-(4-methoxyphenyl) nicotinamide (5) and 4-(4-methoxyphenyl)-2-methylnicotinamide (6), which did not contain any broadened signals (Fig. 8, 9 Suppl. materials). Chemical exchange depicted in Schemes 1 and 2 is probably facilitated when the negative charge which arises at the removing of NH proton during its transfer is stabilized by delocalization. In the case of the compound (4) this delocalization is provided by the carboxylic substitute and in the case of the compounds (1), (2) by the formation of an aromatic system. It could also be necessary that both nitrogen atoms between which the proton moves during tautomeric transformation are in the single conjugation chain and can freely exchange not only protons, but also π-electrons. This condition is satisfied for the compound (4) and is violated in a case of pyridines (5), (6) which gives no broadened signals in 13C NMR spectra. Another condition for the manifestation of tautomerism depictured on scheme 2 requires the application of prototropic polar solvent (DMSO-D6 in our case). 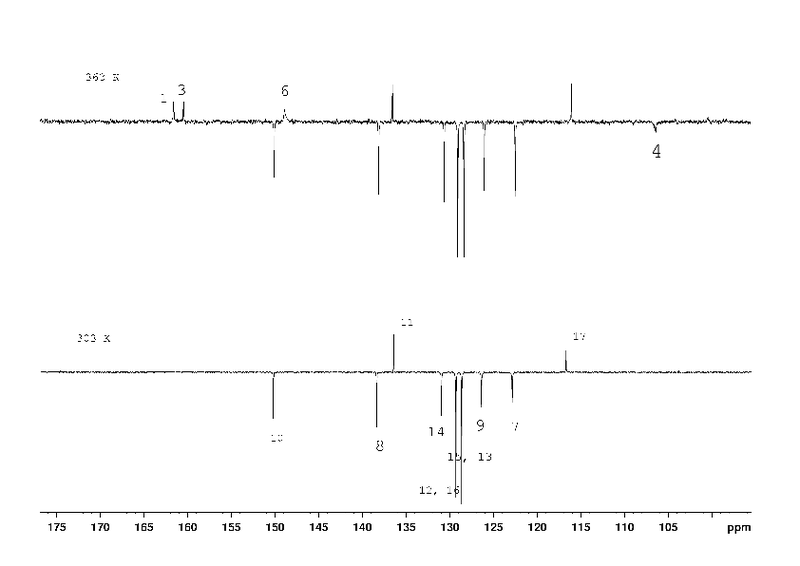 Completely corresponding to the structural formula, the 13C NMR spectrum of methyl [4-(4-methoxyphenyl)-2-methylpyridin-3-yl] carbamate (7) in CDCl3 (Fig. 10, suppl. materials) which differs from compound (4) only by exchange of Cl to CH3 in its molecule have no broadened signals. It should be noted that the considered tautomerism is manifested in 1H NMR spectra either. For example, similar proton signals are on average twice more broad in compound (4) than in (5) or (6). But this fact is usually ignored, since there are no problems with identification. The especially demonstrative case of tautomerism has been detected in a case of 1H, 13C NMR spectra of CDCl3 solution of 1-[6-methyl-2-(methylamino)-4-(4-methylphenyl)pyridin-3-yl]ethanone (8). There are spectra of compound (8) and signal assignment in Fig. 11, 12. Essential broadening of several signals in 1H, 13C NMR spectra of pyridine (8) is explained reasonably by the suggested scheme 3 of chemical exchange. Close vicinity of N-atoms participating in tautomeric proton transfer in compound (8) can explain its occurrence in not prototropic CDCl3. Serious problems of identification of some pyridine derivatives by NMR because of the broadening of signals can be reliably attributed to special cases of prototropic tautomerism. 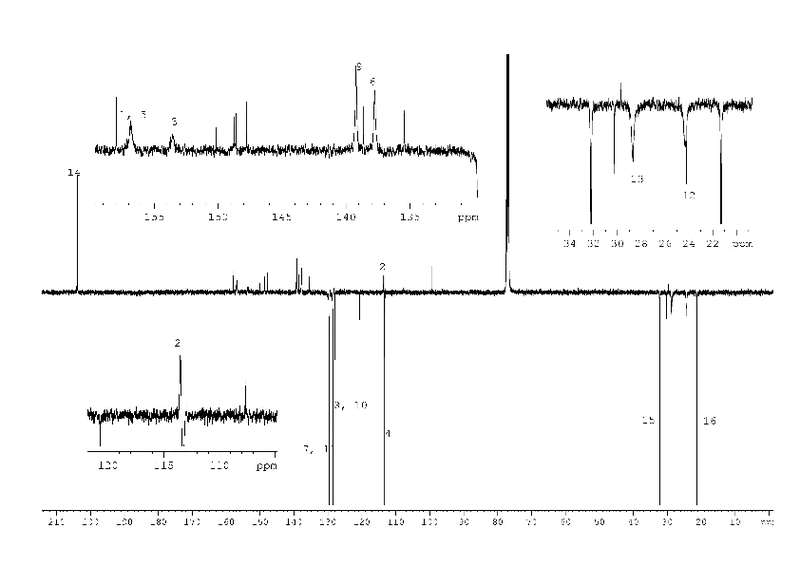 The 13C, 1H spectra of pyridine derivatives (1) - (7) were recorded on an Avance 400 (Bruker) NMR spectrometer using mainly DMSO-D6 as a solvent and CDCl3 for deuterium stabilization and as an external standard. To record 13C NMR spectra, the APT pulse program was applied with a relaxation delay of 6 sec. To exclude saturation as a reason for reducing the intensity of the signals of the carbons, a large relaxation delay (40 s) was employed in a number of experiments. The durations of π/2 pulses were 3μc (1H) and 7μc (13С). The pulse programs HSQC, HMBC (versions with gradient pulses) which are part of the program package of the spectrometer were used to record two-dimensional correlation spectra. The authors are grateful to Dr.Sc. A.S. Fisyk and Ph.D. G.P. Sagitullina for providing spectrally pure samples of heterocyclic compounds. Fig.12. 13C NMR spectrum of pyridine (8). Several unlabelled very narrow signals belong definitely as was shown experimentally to acquisition artifacts. Fig. 6. 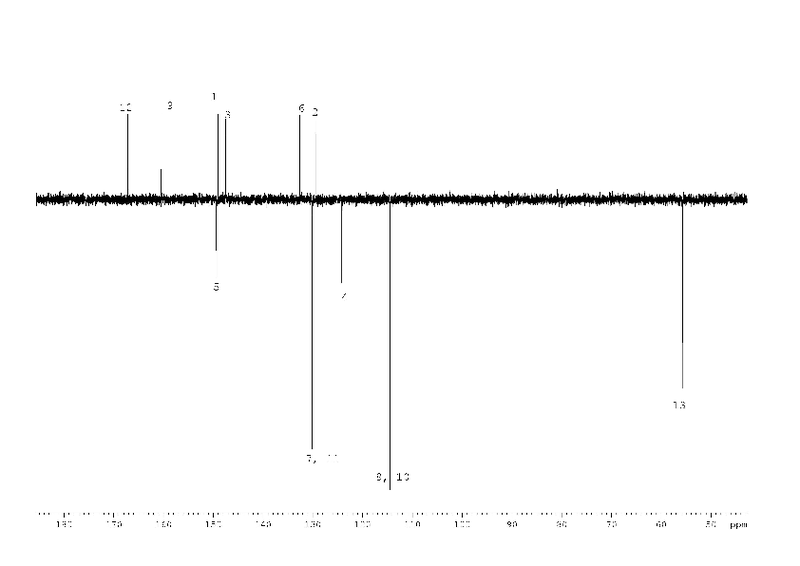 13C NMR spectrum of compound (4). Fig. 5. 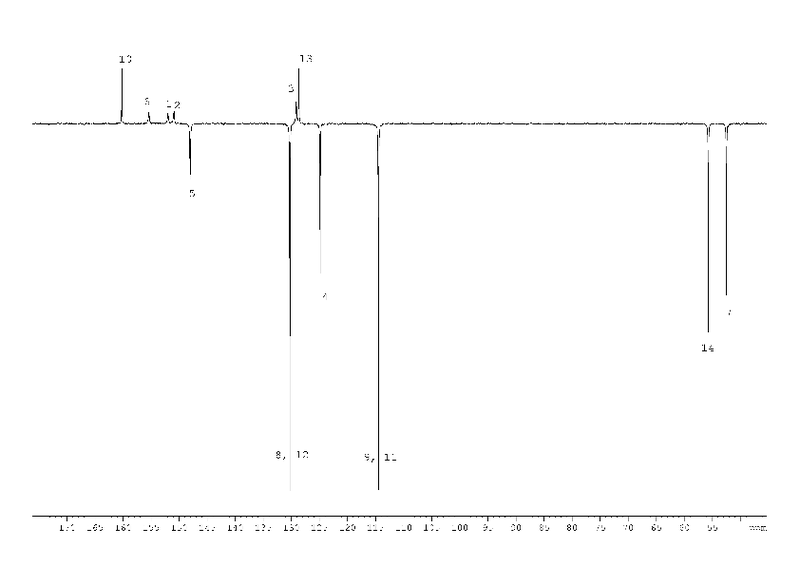 1H NMR spectrum of compound (4). Fig. 4. 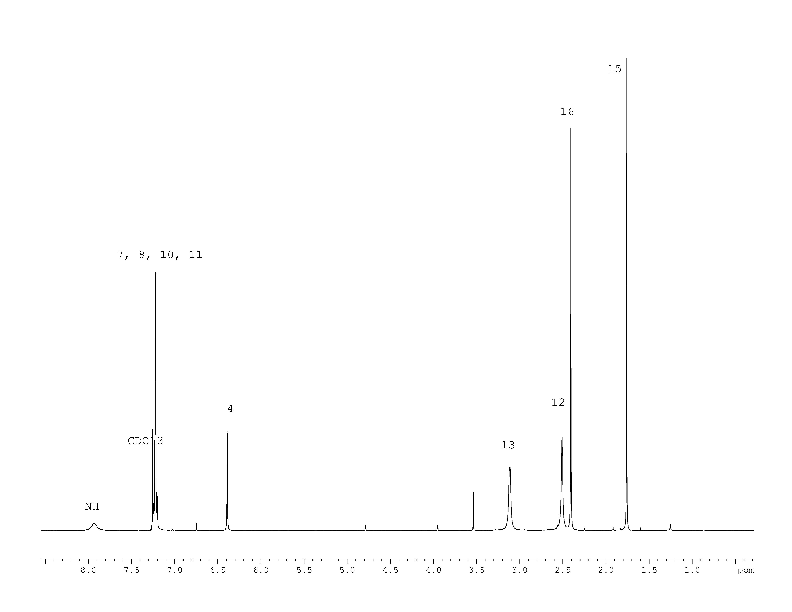 13C NMR spectrum of compound (2). Fig. 3. 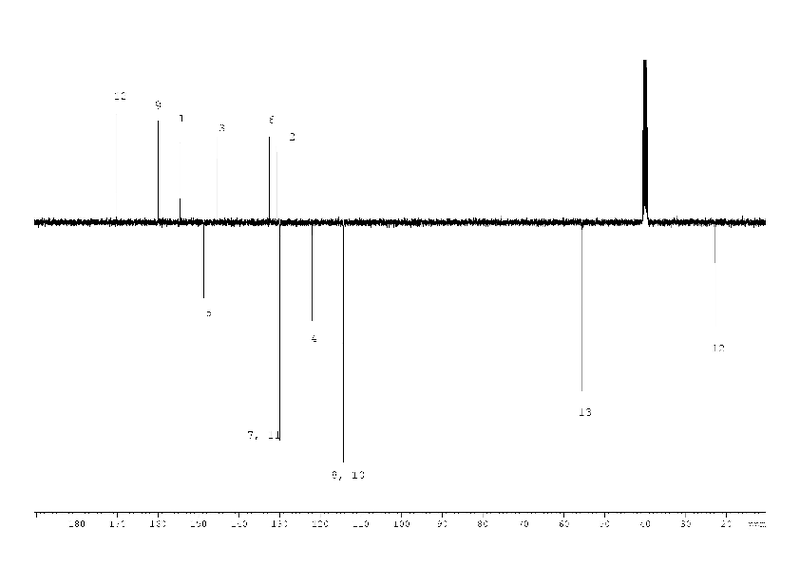 1H NMR spectrum of compound (2). Fig. 2. 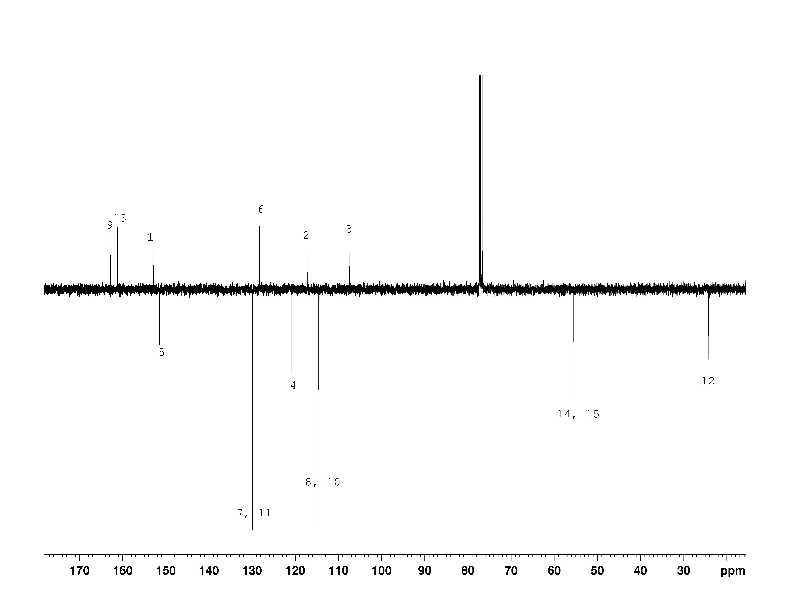 13C NMR spectrum of compound (1). Fig. 1. 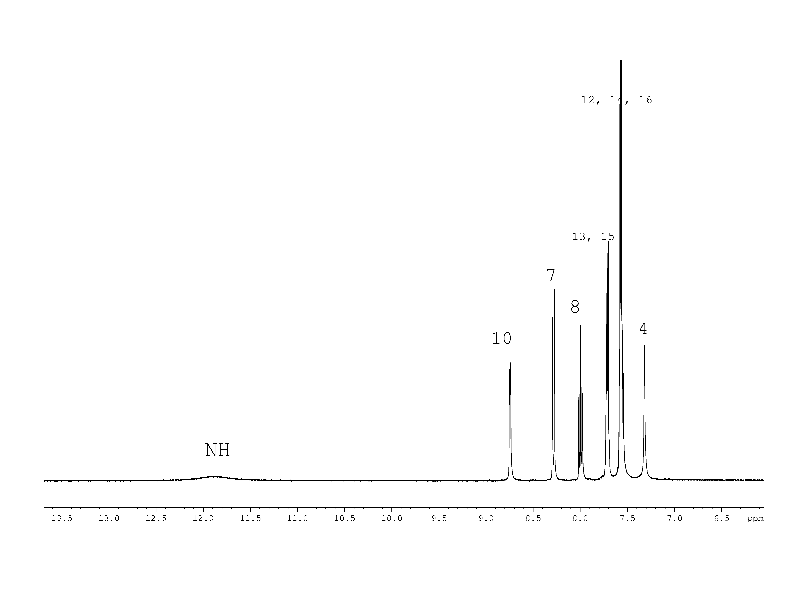 1H NMR spectrum of compound (1). Tautomerism: Methods and Theories, First Edition. Edited by L. Antonov. 2014 Wiley-VCH Verlag GmbH & Co.
G.P.Sagitullina, Chem. Heterocycl. Compd. 2011, 4, 635. V.P Savin,., V.P. Talzi, N.O. Beck, N.O., Zh. Org. Khim.,1984, 20, 1842 - 1848. V.P. T?lsi., S.N. ?vdokimov, Zh. Org. Khim. 2017 (in press).